Hooray it is time for Sweet Treats and we have some very pretty things to share with you today. Elie Saab's gowns could easily be used as a wedding gown. We adore this icy-blue tulle gown that is draped and gathered at the waist and accented with metallic silver. Way Gorgeous! 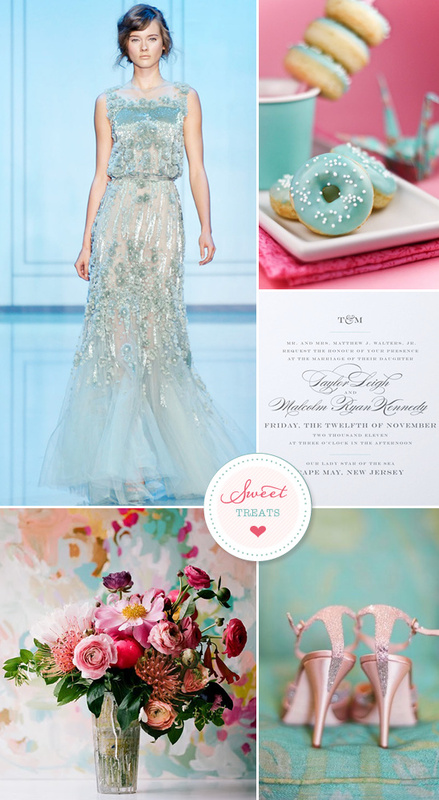 Keeping with the icy blue theme, it would be glorious to have frosted donuts the same hue as your dress. Your guests can anticipate a simply dreamy wedding when they open these elegant invitations from minted. These relaxed, yet stunning flowers would add the perfect balance to your glamorous event. The silvery pink shoes were photographed for a wedding by Elizabeth Messina that Atelier Joya planned. She is a display designer for Anthropologie and the bride! This is a can't miss on Wedding Chicks. Handmade and whimsical details on a very reasonable budget. Have a summertime garden wedding to attend? Ramshackle Glam tricks you out in floral finery. Reem Acra for Shopbop has arrived! Shop the complete collection on BRIDEfinds. A sweet as can be love story + a scavenger hunt proposal that will have you swooning on the edge of your seat & a destination wedding dreams are made of! I'm going out on a limb here saying this is my favorite. feature. EVER! It's exactly what Heart Love Weddings is all about! You don't want to miss the gorgeous details in this elegant pink, blue, and silver wedding on Every Last Detail!